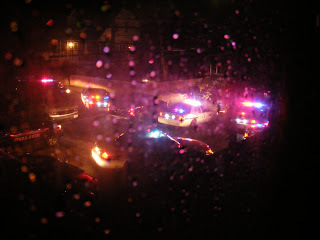 Um, nothing gets you going at 2am better then a police car chase that ends in a crash outside of your house! I was feeding the baby, and heard a racing motorcycle engine... followed by squealing breaks... then a crash. One second later there were cop cars. Trav went to check things out. Turns out the guy had taken off into the park, leaving his female passenger injured on the side of the road. The police did catch him... but for the next hour our block was lit up like the damn 4th of July by over a dozen cop cars. Crazy, middle of the night excitement!! WOW! Luckily it wasn't INTO your house! Nothing like some excitement every once in a while though huh? We don't get the cops chasing ppl like that around here but we do get the sirans every once in a while and that's enough for us.